The first three days of the passage from Hobart to Bluff New Zealand had fantastic winds and Duet loved every minute of it. As a high-pressure system moved over us the wind dropped and we motored for 2 days before the wind filled in again. We kept the pressure up knowing that bad weather was coming up behind us. Someone once said, no one sits around waiting to be shot. We arrived off Bluff at about 0930 on Friday 18th . Total distance from Hobart of 990 miles in 5 days and 21 hours. 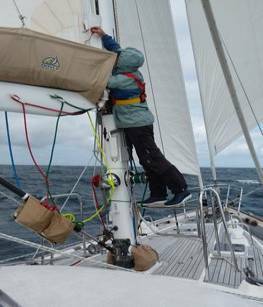 To make life easier when handling the mainsail we made an extra bar to fit on the bars around the mast. The photo shows Simon adjusting the leech line. Sometime after we passed Puysegar point. A landmark and lighthouse that marks the entrance to Preservation Inlet and Fjordland, we turned on the SSB to listen to local legend Merie who has been running Bluff Fisherman’s Radio for about 20 years or more. This is an entirely voluntary service she provides for the local lads at sea. She broadcasts not only the weather information but also an evening roll call of fishing boats and yachts that are around so she knows where everyone is. Meries’ is the wonderful friendly voice of Southland. That evening we heard her call us up. How on earth did she know we were around? She told us that she would contact customs, arrange a berth for us in Bluff and she said she’d see us in the morning.. In the morning she called us up again and said she’d be down to take our lines having directed us to the wharf. You will recognise me, she said I’ll be the one in the pink shirt. And there she was, good as gold. Bluff is not a harbour we wanted to linger in. After customs and bio security departed we raced off to the local supermarket to replenish our fresh stocks then fled over to Stewart island, tucked ourselves into a protected anchorage and slept for the following 10 hours! If we hadn’t pressed on when we did we could now be coping with 50 knots of wind.